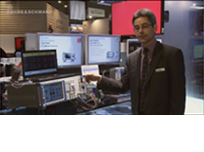 Rohde & Schwarz demonstrated the most compact solution for LTE-Advanced 2x2 MIMO testing at the GSMA Mobile World Congress 2013 in Barcelona. The R&S®SMU200A vector signal generator simulates a 2x2 MIMO uplink signal with fading for receiver testing. An LTE-Advanced 2x2 MIMO downlink signal, generated by a small cell, is captured and processed by one R&S®RTO digital oscilloscope. The R&S®FS-K10xPC LTE analysis software enables detailed analysis of the received signal.